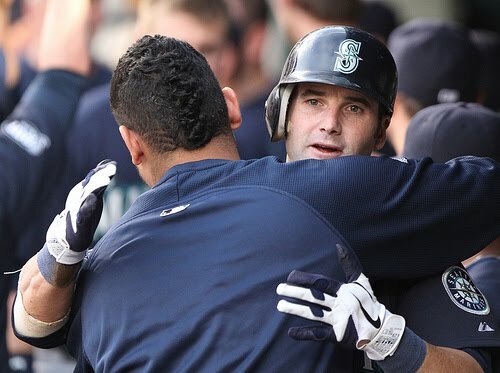 Adam Kennedy was tonights hero as the M's took it to the Yankees for the second straight night. If the Yankees were a team of zombies trying to take over the M's, the M's followed Rule #2 of Zombieland, the Double Tap! We knocked them down last night with a 4 to 3 win and hit them again tonight! Double Tap!!! Justin Smoak hit a single with one out in the ninth and was followed by Jack Cust who hit a double. Luis Rodriguez was put in to run for Smoak at third and Franklin Gutierrez was intentionally walked to load the bases for Adam Kennedy. Kennedy took a 0-1 pitch and blooped a game winning single into center field. The entire team mobbed Kennedy and celebrated on the field with smiles as big as could be. They're having fun!!! It was a tough game for Felix Hernandez, who, like Pineda, gave up a homerun to Mark Texeira. THis blast was a two run shot to put the Yankees up 3-1 at the time. The M's followed the next inning to score 3 runs of their own and take the lead 4-3. That lasted until the 7th when Felix gave up a triple to Granderson that scored Derek Jeter who was on first after being walked. The game was knotted up there until the 12th when the M's once again REFUSED TO LOSE!!! This time giving the big "L" to Mariano Rivera and handing David Pauley another win in relief, extending his record to 4 and 0. Pauley has been absolutely outstanding this year in relief holding a very low 0.84 ERA. Amazing!!! Something has to be drastically wrong with Ichiro and Figgins. The top three in our lineup went a combined 1 for 16 with Smoak getting his hit in the 12th. The 4 through 6 hitters went a combined 7 for 16 as Cust got his hit in the 12th while Gutierrez and Kennedy each had three hit nights. Finally our 7 through 9 hitters went a combined 5 for 13 as Olivo also had a 3 hit night and Brendan Ryan continued his hot hitting going 2 for 4. This team has been utterly amazing and continues to get better and better. I can only imagine what may happen when Ichiro and Figgins pull it together. The M's tonight went a game above .500 and won another series. More importantly, with the Angels losing to the Twins, the M's took sole posession of second place in the AL West still a half game behind the Rangers. Let's get those brooms out for Sundays game!